A delightful coffee cake at a brunch, oh yes! 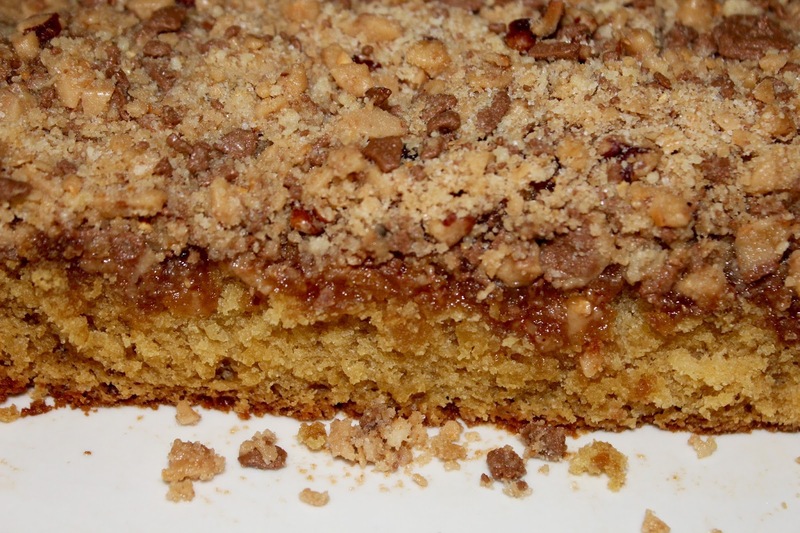 Making that coffee cake extraordinary with toffee, double yes!! Brunch Bonanza continues with the best coffee cake ever! It's no secret we love toffee around these parts. 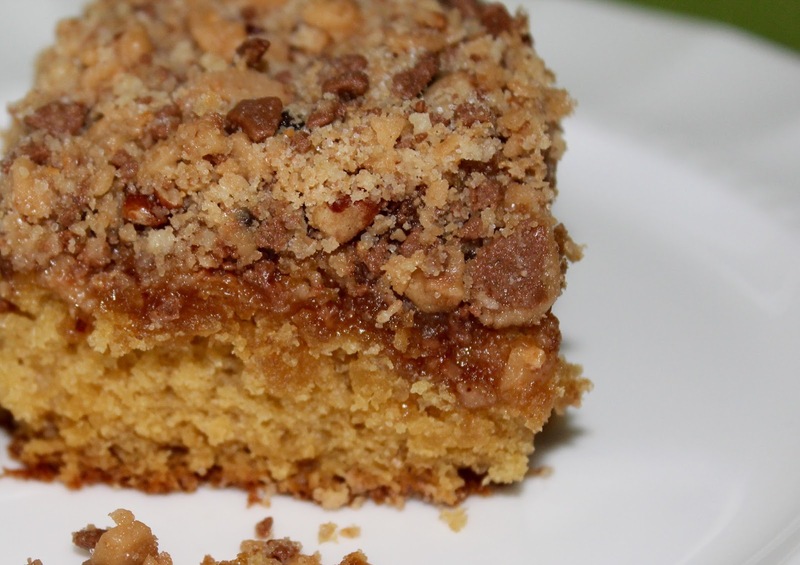 Remember those Toffee Pecan Dream Bars and Cinnamon Toffee Blondies? It's also no secret toffee makes baked goods so good!! 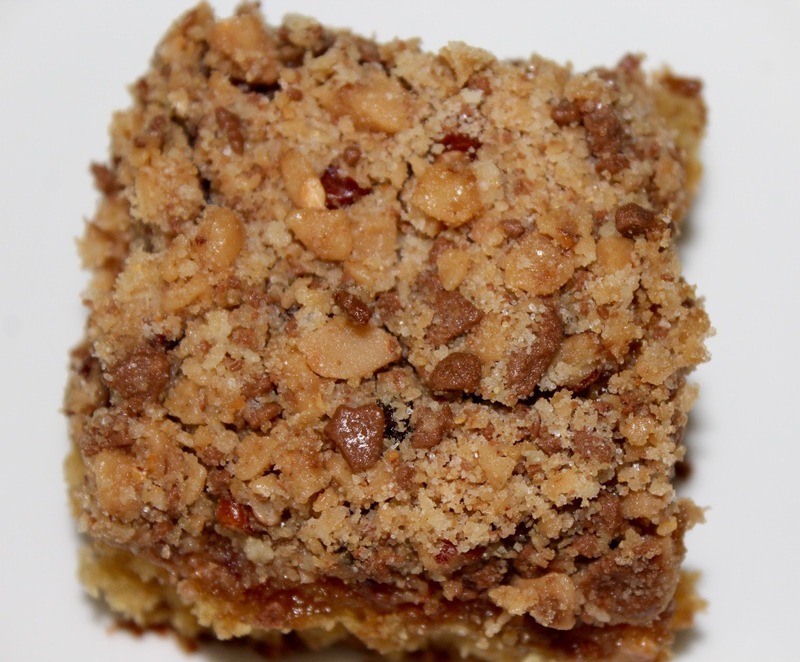 So, as I was thinking about a scrumptious coffee cake, the idea of adding delightful toffee bits came to mind. You know what I love even more about this coffee cake, is it got more moist with each day. Which means, you guessed it, you can make this ahead of time and it will not dry out but be even more scrumpt-de-Lee-umptious!! Plus, it is soooo easy!! Just look at those Heath Milk Chocolate Toffee Bits....YUM!!! Preheat oven to 350 degrees. In Large mixing bowl, blend butter, sugars and flour; set aside 1/2 cup for the topping. To the remixing butter mixture, add buttermilk, egg, baking soda, salt and vanilla. Pour into a greased and floured 13x9 baking dish. Combine the Heath Bits and the pecans with the reserved butter mixture. Sprinkle over coffee cake. Bake for 30-35 minutes or until a toothpick comes out clean in the center. Cool. Cut into squares. SO I am sitting here drinking my coffee drooling over the beauty of that coffee cake on my screen and wondering why exactly I cannot have a piece of that right this second. Thanks, Andrea, thanks a lot LOL! You can't go wrong with toffee and cake! YUMMY! I wish you could teleport this to me right now to have with my coffee, Andrea! haha! It looks so delicious and I love the idea of adding toffee to it. Happy Tuesday! mmm... give me that & a cup of coffee & my day is made! This looks delicious! I didn't know you could buy toffee bits, and quite frankly I don't know what they taste like...hmmm...??? Is it like hard caramel? In any case, this looks delicious! You always come up with the BEST recipes! How you are not 500 pounds I don't know! Hahaha that ecard! Toffee and coffee cake??? I will so have to try this out after Whole 30! I love toffee, I love coffee cake - perfect combination. Yum!! 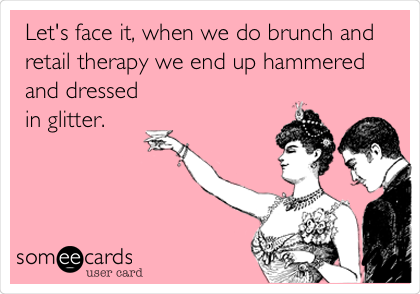 I need to make this for the next time people come over to our house for the weekend! It looks so easy, and I love that you added toffee to it! Yum! My mouth is literally watering right now...and all I have to snack on is cucumbers! That's just not going to cut it when I'm craving toffee coffee cake! Oh my goodness this look delish!! I LOVE toffee! I'm going to have check out and pin your other recipes!! I love toffee and this looks so good! It would be a great mid-day snack too! how am I expected to keep to my new year diet with you posting these delicious confections! Seriously, this looks so amazing. My son will love it. Pinning! Oh dear does this look delicious! I am going to have to try this out soon, maybe to surprise my coworkers at our Tuesday team meeting next week! When I read your recipe posts I am so ready to eat whatever I want and wear caftans! Dang girl, my pants are getting tighter and my mouth is watering, this recipe looks so good! Love it! GIRL! I'm finally beginning to feel like myself again! 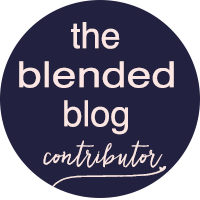 I am so far behind on blogging, so I apologize if I have not been commenting lately. That root canal was of Satan! I would rather have another baby than have a root canal again! But, oh! I think I feel a pain coming on! Will you hop on a plane and bring a slice of this to me? Pretty please! Oh wow, my husband would love this! Pinning to share! Thanks for sharing your recipe with us at Brag About It! Have a super week! Toffee in coffee cake? This sounds amazing! Thanks for joining us for the Wednesday Showcase. Yum, yum, yum! I always forget about heath bits, but they're so good! This cake is perfect! YUM! Toffee might be on of my most favorite things - saving to make this weekend! I do Looove a good coffee cake. Thanks for sharing! I love coffee cake and add toffee, what is left to say. I wish I had a piece of this right now to go with my coffee. Looks so good! Thanks so much for joining us at the #happynowlinkup! I know I shouldn't be trying new desserts, especially after the holidays, but this coffee cake is one that I will make. 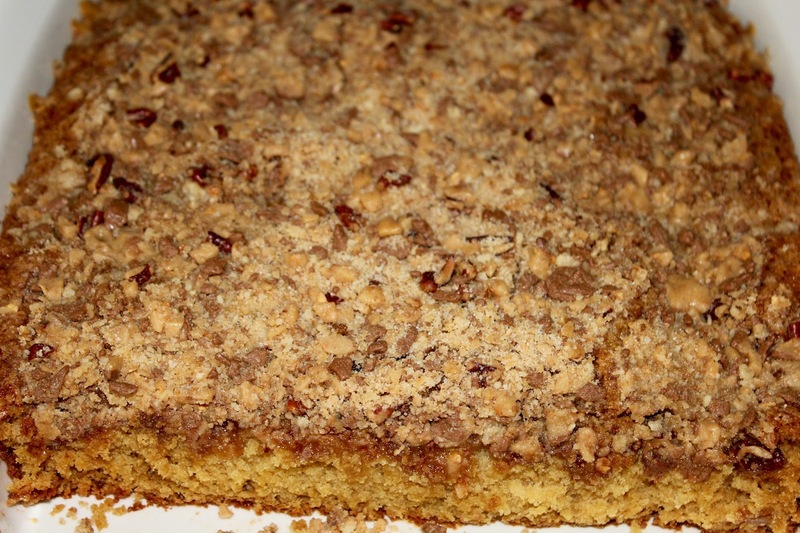 I love this type of coffee cake and since you added toffee to it, it will make it even better. Can't wait to enjoy every bite of this wonderful coffee cake. 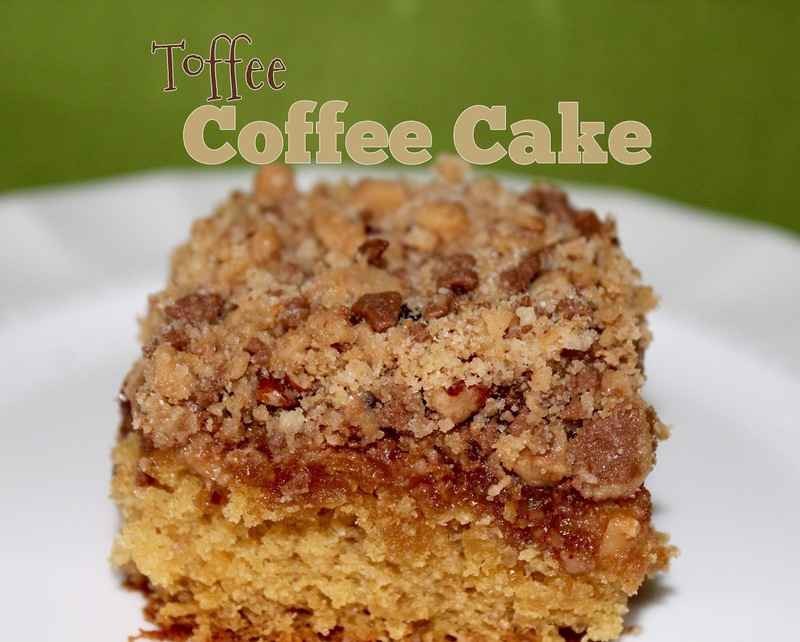 Your Toffee Coffee Cake looks delicious! It was the most clicked from last week's Snickerdoodle Party. All of the party co-hosts will be featuring it at tomorrow's party. Hope to see you there! Thanks for partying with us. This looks delicious. Of course I could just eat the bag of heath crumbles, but on a cake too. I have pinned this and really hope to make it soon. Thank you. I made this on Friday to have over the weekend. It was outstanding and stayed nice and moist. A keeper of a recipe for sure! I am so happy you liked the recipe Teresa! I know it is one of my favorites! Thank you sweet lady! Have been looking for a different recipe for the Garden Club brunch this coming Wednesday. This looks perfect. Thanks so much! 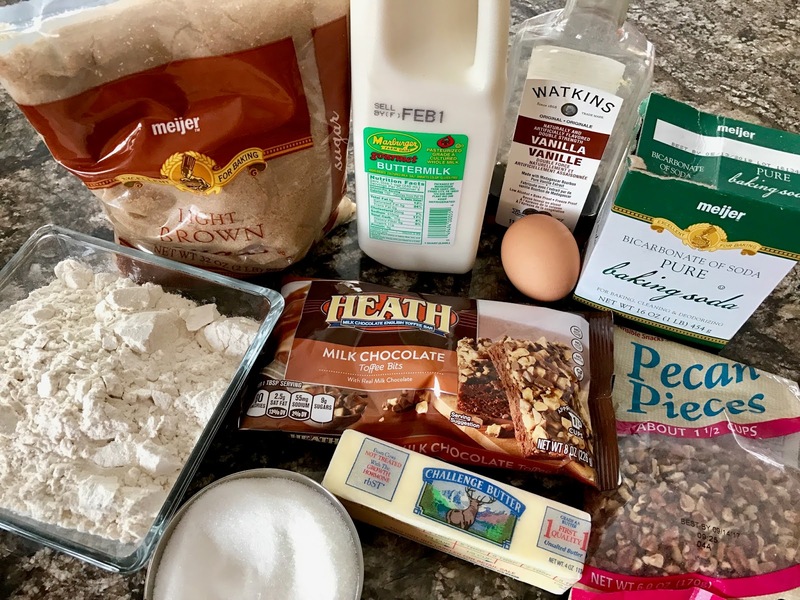 Hi, I'm here from Southerbites and would love to try this coffeecake. My only problem is I cannot find a print button. I know I need new glasses but I swear I have looked all over and am only seeing Pinterest. I do have an account but rarely go there. So is that the only place to be able to print from? Thanks, LOL = Little old lady. I apologize. We do not yet know how to install a print button. You have a few options, What I do is just press the print tab when you’re on the post and you’ll get the other wording but the recipe will be there or you can copy and paste the recipe into a word document then print. That’s probably the easiest. What a delish looking and classic recipe that everyone would love at a brunch! Thanks for sharing at our Brunch week link up!